Properly positioning someone in bed will not only make them more comfortable, but can help prevent them from developing painful pressure ulcers, also known as pressure sores or bedsores. Here's how to position someone in a manner that is safe for them—and for you. Using the controls, raise the bed to a level that reduces the strain on your back. Roll the patient to one side, then place a half rolled-up slide sheet or draw sheet against the person's back. Roll the patient onto the sheet and spread the sheet out flat under the person. Make sure the head, shoulders, and hips are on the sheet. To move a patient as safely as possible, you'll need another able-bodied person who can help you lift and position the person. The buddy can be a spouse, a sibling, or a teen or adult child. Just make sure this person is reliable and strong enough to carry out the task. Grab the slide sheet or draw sheet at the patient's upper back and hips on the side of the bed closest to you. Put one foot forward as you prepare to move the patient. Put your weight on your back leg. On the count of three, move the patient by shifting your weight to your front leg and pulling the sheet toward the head of the bed.You may need to do this more than once to get the person in the right position. If your loved one is going to remain on her back, raise the foot of the bed enough to bend the knees. In addition, you can place a pillow under the knees to prop the person up so she doesn't slide, which can create painful skin sores. Place another pillow under her ankles with her heels "floating" off the end of the pillow to alleviate pressure on the heels. Use pillows as needed to place under the person's head and arms for comfort. If he is unable to let you know if he is comfortable, you'll have to use your judgment. If something doesn't look comfortable, it probably isn't. Adjust as necessary until the person looks cozy and content. Never move patients up by grabbing them under their arms and pulling. This can injure their shoulders. Stand on opposite side of the bed. Reach over the person and grab the drawsheet on the opposite side. Gently pull the drawsheet towards you while your buddy gently pushes the person's hip and shoulder towards you. Place a pillow or a foam wedge under the drawsheet at the person's back. Position the pillow close against the back to help prop the person on her side. Place another pillow or a specially designed foam leg wedge between the person's knees. This extra bit of support will add to her comfort by keeping the spine in alignment and by easing pressure on the bony areas of the knees and ankles. Use another pillow to prop the person's arms. This technique is done by sight. 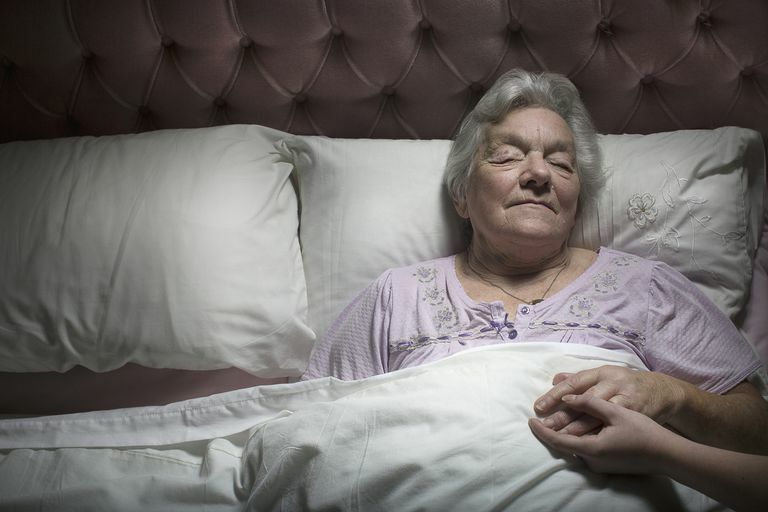 Nurses have found that most patients are comfortable with the arm on the side they are lying on, propped on a pillow to keep it from being compressed between the body and the bed. Alternate between the back, right side and left side every two hours while you're awake. Ideally, a nurse or a physical therapist can train you in positioning a person safely. If you have questions about how to do it properly, or if you see signs of skin injury, contact a healthcare professional to reduce the risks to your loved one's comfort and well-being.